The Rock Band 3 keyboard is currently in prototype. We already knew that Rock Band 3 was going to feature keyboards - now we have a better idea of how they're going to be implemented in gameplay terms. 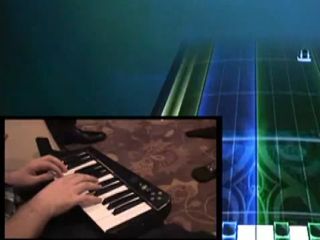 The video above shows a prototype of the 2-octave keyboard being used (a touch strip is also said to be included on its keytar-style neck). It appears that, in easier modes, you'll only be required to hit a note somewhere in the right ballpark to succeed, but as the difficulty level increases, you'll have to be more accurate. This suggests that those who master the Rock Band 3 keyboard might actually have some genuine transferable skills that they can take to a real instrument, which has to be a good thing. It should also be said that, now that keyboards are part of the Rock Band experience, more electronic acts might be encouraged to get their music on the Rock Band Network. Time will tell if the keyboard will be usable as a MIDI controller, but someone out there is sure to try it and find out.